The gentle fall of autumn leaves is disturbed by the passage of a late 1950s MAN tramcar and trailer, leaving a swirl of gold in its wake. A nostalgic dream ? No – this is ‘Braila Parc’ in October 2008 ! Braila is a city on the River Danube in the south eastern part of Romania, about 200 km by road from the capital Bucharest. It has a standard gauge tramway with two primary routes. Numbers 21 & 22 which have a daytime frequency of about 10 minutes. There are also two secondary routes numbers 23 & 24 which have an hourly frequency. A wonderful feature of the Braila system is that all four routes run in the extensive ‘Braila Parc’, and indeed the 24 route has its turning circle amongst the park woodland. The operating company, S.C. Braicar S.A., run a very interesting fleet of tramcars from other cities in Europe at the time of filming, and in most instances neither livery, nor running number had been altered by their new owners. This gave rise to the delightful anomaly in that there were two cars numbered ‘1601’ – one from Nürnberg in Germany and the other from Rotterdam in Holland ! We then move on to Ploiesti where KT4D trams from Potsdam, and magnificent FBW articulated trolleybuses from Geneva circulate outside Ploiesti Sud railway station. Ploiesti is the ninth largest city in Romania and is 56km north of Bucharest. It is perhaps best known for the oil extraction and refinery industries, but our focus is upon its electrically-powered passenger vehicles of course. 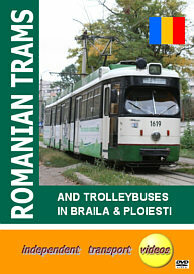 So join us and enjoy visiting these little-known Romanian tram and trolleybus systems from the comfort of your armchair.